I used to have an iPhone SE, and I loved it. My hands are stubby, and I liked the fact that the iPhone SE just fit in my hands well. But I upgraded to the iPhone X (Yaasss animoji and portrait mode! ), and now I have to use both hands to touch this damn screen. 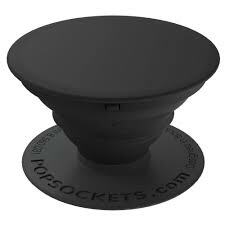 Pros: The Popsocket helps you grip your phone better, so you'll no longer worry too much about dropping your phone. Cons: It's being held on your phone by a sticker, so naturally, after about six or so months, the sticker might fall off (it did for me). I just ended up buying a new one.